Turtle vendors and their daily inventory of wild caught turtles and tortoises. Centuries old Chinese trade routes spread like fingers throughout Asia bringing the fauna of the continent into their food markets. By now, we are accustomed to seeing images of these animals horrifically mistreated while waiting to be sold for food, traditional Chinese medicines or in the rare instance to be released as a good luck omen. What is new here is that the trade in turtles and tortoises, most of which have been captured in the wild, has become massive. When the Chinese currency recently became convertible, it made turtles and tortoises a cash commodity, putting demand pressure on supplies in other Asian countries, who until then, had used the turtles for their own local consumption. In order to meet the increased demand from China, harvesting methods of wild turtles and tortoises had to be successful enough to achieve commercial feasibility. Apparently successful enough that in 1996, 7,716,000 pounds (3.5 million kg.) of turtles were imported and consumed in Hong Kong alone. 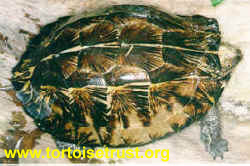 The most common turtle found in this market was Mauremys mutica. Averaging 2 ½ pounds (1.2 kg.) each, that equals well over 3 million turtles in one year (Bosco Chan, pers. com. report to TRAFFIC Hong Kong, in preparation). However, the markets are indiscriminate as to species, and include 80 pound (36 kg.) 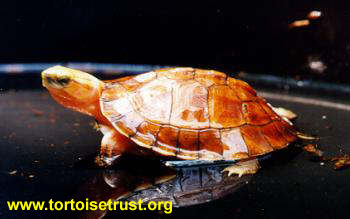 adult Orlitia borneensis and 31/2 ounce (100 gram) Geomyda spengleri, so the number of turtles in absolute terms varies. 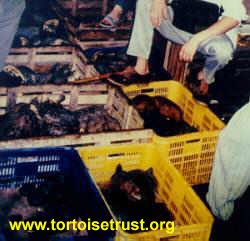 In 1993 approximately 200,000 – 300,000 individual turtles and tortoises were exported from the Cau Mong market in Ho Chi Minh City. Approximately 100,000 of these were Indotestudo elongata (Jenkins 1995). However, in order to gauge the thoroughness of the destruction of the turtles of Asia we must consider the three prong attack on the river turtles; the collection of adults, harvesting of eggs and destruction of habitat. This for example, has led to a reduction of Batagur baska in peninsular Malaysia by over 90% in the last century (Jenkins 1995). The situation in Thailand is certainly no better. Maxwell (1911) calculated 2,600 Batagur baska and Kachuga trivittata nesting communally in the Ayeyarwady river delta in 1890. By 1899 this population was down to 820, while in 1982 the same area accounted for “only a few”. Most recently, a United Nations Development Program found none (van Dijk 1997). Callagur borneensis, Batagur baska, Kachuga trivattata and the larger riverine softshell species are captured by a technique that targets nesting females. Lines of hemp or nylon are suspended several inches above the riverbanks between poles stuck in the sand so the line runs parallel to the water line. From this line dangle fish hooks which snag the turtles as they cross under the wire to nest and imprisons them while they await collection by the turtle hunters. This technique effectively removes the breeding females from the populations. Eggs are harvested from the few nests that are managed by females eluding the hooks. More recent perils to these species include “sand mining” and dam construction. Dams alter water height, eliminating nesting sites and in some cases precluding access to the shoreline altogether. The sandy riverbanks, which serve as traditional communal nesting sites are literally being scooped out and removed. As the need for sand for construction increases so does the destruction of the habitats themselves affecting all the wildlife, including turtles. Harvesting for the food markets is by no means limited to professionals. Local peoples are also able to cash in utilizing the ubiquitous “reverse pet shops”. In the villages and hamlets of the Asian countryside, these shops purchase animals of all sorts from the local peoples who collect turtles and tortoises whenever they are encountered. From these shops the turtles and tortoises make their way to the middlemen who then transport them across borders if necessary into the larger Asian and Chinese cites. Mislabeled as seafood, the turtles and tortoises are stacked in wooden crates violating International Air Transport Association (IATA) shipping regulations. They are also hauled over land in buses and trucks. These journeys can take up to several weeks. The trade in turtles is brisk, highly developed and ignored by border guards, customs officials and airline personnel on both the export and import sides of the Asian borders. CITES Appendix I species from throughout Asia are routinely found in these markets, in this case Geoclemys hamiltonii. Flagrant disregard for any and seemingly all international conservation laws are routine as a visit to the markets in Hong Kong, Guangzhou, and Shenzhen will show. The Convention of International Trade of Endangered Species (CITES) prohibits export and import for commercial purposes of species listed as Appendix I. Despite this, Aspiderates gangeticus, A. Hurum, Batagur baska, Geoclemys hamiltonii and Morenia ocellata (all CITES Appendix I), are routinely available in these Chinese food markets. None of these five species are found naturally in China. Das (1990), reports that “large amounts” of Aspidereates gangeticus and A. hurum, are exported from Bangladesh to the Southeast Asian markets. Husain & Sarker (1995, revised 1997) report similar findings as well, additionally reporting that turtles are collected in the winter months when females are gravid. 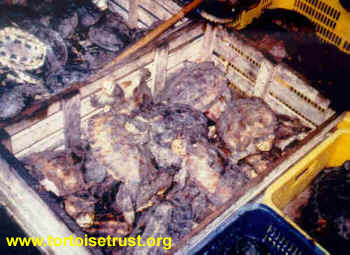 In November 1998, 250 tortoises (species unknown) were stolen from the Kek Lok Si temple in Malaysia. Concerned that the tortoises were destined for the food markets and “would end up in cooking pots”, Abbot Seck Jit Heng was quoted as saying that slaughtering these tortoises for food would contravene the tenets of Buddhism. It is difficult to imagine this theft, as releasing a turtle or tortoise into a temple is considered an act of great charity, to be rewarded in ones next incarnation. Perhaps the wild populations have dwindled to such an extent that measures such as these are now necessary. The inadequacies and archaic political nuances of CITES itself is proving to be a virtual death sentence for many endemic species. 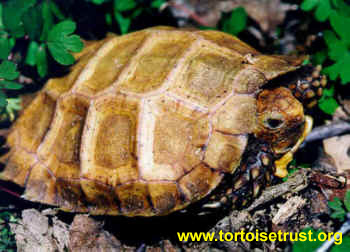 For example, the rare Burmese star tortoise, Geochelone platynota, endemic to Myanmar (Burma), has been found in the Guangzhou and Shenzhen markets in China. Because Myanmar has apparently not issued CITES II export permits, NONE can be legally imported into any country, whether for food or ex situ captive reproduction, despite their occasional availability in the Chinese food markets. In Asia you can eat them, boil them, butcher them, sell them, destroy their habitat but you cannot legally export, hence import any for captive reproduction, which may be their only hope for survival as a species. Keep in mind that as a note to the original description of the Burmese star tortoise (Blyth 1863 in Gunther 1864) states that the indigenous peoples were so fond of eating them that it was very difficult to obtain a living specimen. Hopefully CITES will realize that endemic species cannot be “owned” by a single country and when that country cannot and does not protect the endemic species found within its borders, will take action, or at the least allow responsible conservation groups to do so. A similar situation regarding Madagascar’s endemic chelonians is unfolding. 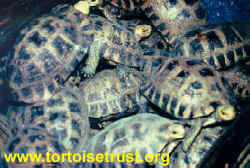 Radiated tortoises, Geochelone radiata, flat tailed tortoises, Pyxis planicauda, and spider tortoises, Pyxis arachnoides are openly offered for sale as holiday feast foods in Tulear and Ft. Dauphin. 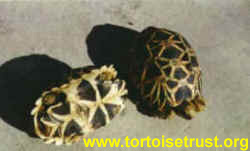 The Mahafaly and the Antrandroy, who consider it taboo to touch or eat tortoises are now induced by cash to sell them. At hotels, markets, gas stations – most everywhere where travelers and tourists stop in southern Madagascar within the range of these tortoises – they are offered for sale for 2000 – 2500 Fmg ($1 US = 5700 Fmg). From here they make their way, sometimes by sea, to the Asian food markets and the Japanese pet markets. 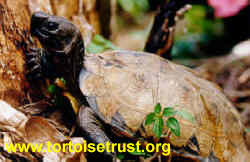 The coastal areas south of Tulear to south of Lake Tsimanampetsotsa and west of Ft. Dauphin to Faux Caphave had recently contained viable populations of these tortoises. 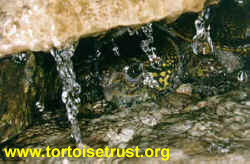 However, recent expeditions in 1999 revealed these areas now devoid of tortoises indicating these areas as the source of the market tortoises. Now the flat tailed tortoise, Pyxis planicaauda, whose habitat is measured in hectares, not square miles, is recognized as being as critically endangered as the plowshare tortoise, G. yniphora. Madagascar has a history of not protecting its endangered wildlife as evidenced not only by this information but by the infamous Geochelone yniphora incidents. The discovery of several new species of turtles is further evidence as to just how efficient and thorough the turtle harvesting in Asia has become. Starting in the 1980’s several species have been discovered as a result of market activities and most remarkably, to date, none of these have ever been observed in situ by any one other than the harvesters and local peoples themselves. The recently described Geomyda yuwonoi can be seen in abundance in this market photo. There is no natural history information or exact range statistics for the newly described Cuora mccordi (Ernst 1988), Cuora serrata ( = Cuora galbinifrons serrata McCord 1992), Cuora zhoui (Zhao1990), Geomyda yuwonoi (McCord, Iverson & Boeadi 1995), Mauremys iversoni (Pritchard and McCord 1991), Ocadia glyphistoma (McCord and Iverson 1994), Ocadia philipenni (McCord and Iverson 1992), Platysternon megacephalum shiui (Ernst & McCord 1987), Sacalia psuedocellata (Iverson & McCord 1992) and another yet to be described Cuora. On a side note, recent German expeditions into Viet Nam have led to descriptions of two Cuora galbinifrons subspecies; C. g. bourreti (Obst and Reimann 1994) and C. g. picturata (Lehr, Fritz and Obst 1998) as well as Cyclemys pulchristriata (Fritz, Gaulke & Lehr 1997) and Pyxidea mouhotii obsti (Fritz, Andreas & Lehr 1998). These discoveries are very exciting from a taxonomic standpoint. However, it is sad to point out that the number of known specimens of these “new species” from a biological standpoint is miniscule. For example, a single male Cuora aurocapitata was found in the Shanghai food market in 1997 (I. Pauler pers. com.). In 1996 and 1997 there were no reported specimens of Cuora mccordi in the Paise food market were they were originally found and no Cuora zhoui in the Nanning food market, where they were originally found (O. Shiu pers.com.). Since then a “very few” C. mccordi were sighted in Paise in 1998 (O. Shiu, pers. com.). To date, there are perhaps no more than 350 C. mccordi known to exist, all of which came out of the food markets and now are in private or zoo collections, many of which are in Japan. Despite this grim outlook, survival prospects for C. mccordi, in particular, are promising. C. mccordi adapts well to captivity and is consistently reproducing. Further, there have been no sightings of Ocadia glyphistoma since 1996, and no sightings of either Ocadia philipenni or Sacalia psuedocellata since 1990 (W. McCord pers.com.). There are, perhaps, too few of these three species in captivity to expect captive reproduction to be an option in saving these from extinction. These findings are relative to a market scenario as previously described in Hong Kong in 1996 and Ho Chi Minh City in 1993. It may well be that some of these newly described turtles were not as rare as their having been recently discovered would lead one to believe. A distinct possibility is that their natural ranges are very restricted and remote. Consider the diversity and range of Graptemys in the US and Homopus in Southern Africa. Both of these genera have congeners living in relatively close proximity to each other yet separated by natural barriers. This does however, reinforce the need for both in situ conservation and ex situ captive reproduction of Asian chelonians, as these species are even more vulnerable to extinction due to the market implications presented herein. “Rediscovery” of the ultra rare Geomyda depressa occurred in 1995 when a local peasant presented two specimens to a dealer in the Ruili food market in China. 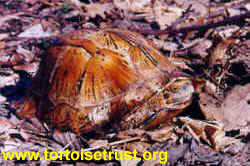 The last prior recorded siting of this turtle was in 1908, which until that point was the sixth specimen known to exist. Since this remarkable finding there are have been approximately another 40 specimens of this rather large gregarious turtle which have been found, all having come out of Ruili. Indications are that G. depressa does not do well in captivity. The only two captive reproduction programs for G. depressa are hindered by the complete void of natural history information of this turtle and further exacerbated by confusion as to where the natural range of G. depressa actually is. 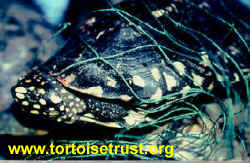 Turtle farming or ranching as an alternative to further decimation of wild populations does not seem to be an option. Not only is it a case of too little too late, it appears that turtle farming in Asia is limited to Pelodiscus sinensis, the Chinese softshell. 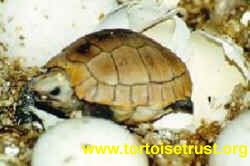 Softshell farms in Thailand have produced as many as six million hatchlings of P. sinensis in a single year. Unfortunately, attempts of applying the same farming techniques to other Asian softshells species have not succeeded. 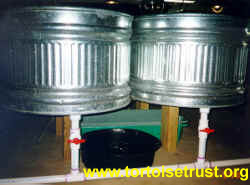 It is generally considered that hard shelled turtles and tortoises grow too slowly for them to become economically attractive for farming. Historically, the market prices for most hard shelled turtles and tortoises had been generally similar regardless of species. An exception to this is Cuora trifasciata, which traditional Chinese medicine places a higher value on, consequently driving up demand and price. This has resulted in small scale grass roots type “ranching” of C. trifasciata in China, the scale of which is unknown. The Vietnamese people are fond of keeping Geomyda spengleri as pets and in these instances, breeding is known to occur. Whereas these possible farming instances are not feasible for food market distribution, due to the small size of the turtles, they may be well suited to pet market economics. Commercial opportunities from the pet sector could provide the necessary incentive to ranch the hard shell species thus creating a self sustaining supply and becoming a de facto conservation activity, perhaps buying some time for these species. The degree to which captive husbandry succeeds with Asian turtle and tortoise species varies widely. Cuora galbinifrons, Morenia petersi, Pyxidea mouhotii and perhaps to a lesser degree Geomyda spengleri have histories of high mortality. Stress, dehydration and parasite infestation, play a large role in the demise of the “pets”. It is very important to note that Asian turtles imported into Europe and the US for the pet and collector trade, come out of the food markets and as such, long term survivability of the specimens was never an agenda. 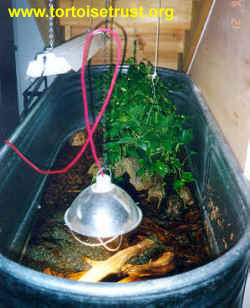 However, many survive and now these animals can and do play a role in captive propagation. Recent advances in drug protocols have helped tremendously in the eradication of detrimental, potentially fatal, parasite infestations typically associated with Asian food market turtles. Increasing survivorship of imported specimens, especially the more sensitive species, is helping tremendously in establishing founder stock for ex situ captive reproduction programs. Richard Fife, a pioneer herpetoculturist and accomplished breeder of tortoises and lizards has reported that after administration of drug protocols to eliminate gastrointestinal parasites and probiotic paste to re-establish gut flora, a group of Heosemys spinosa, have become “aggressive feeders……They come out aggressively after their food and even stand on three legs trying to reach a piece of banana held just out of their reach”. What is most significant is that these H. spinosa, along with specimens of Cuora flavomarginata, C. galbinifrons bourreti, C. galbinifrons galbinifrons, C. serrata and Pyxidea mouhotii were rescued from the Guangzhou food markets by Mr. Fife and now serve as viable breeding groups. There is absolutely no doubt, that if not for Mr. Fife’s actions, all of these particular turtles would have been consumed in China. So, in effect, these particular turtles were not only saved, but now fulfill a role as founder stock for a viable breeding situation. This adult was rescued from the Guangzhou food market and is now part of a captive breeding program in Arizona. The American Zoological Association is finalizing plans for a studbook for the genus Cuora. These plans consider inclusion of private breeders and collectors. Ex situ captive reproduction of Asian chelonians has been largely inconsistent, however, a few dedicated individuals have developed husbandry and breeding techniques for many of the Asian species. This information is now available and should allow others to succeed with captive propagation programs as well. To date, Coura amboinensis, C. aurocapitata, C. flavomarginata, C. galbinifrons galbinifrons, C. galbinifrons bourreti, C. mccordi, C. trifasciata, Chinemys reevesi, C. nigricans (= kwangtungensis), Geoclemys hamiltonii, Geomyda spengleri, Heosemys grandis, H. spinosa, Indotestudo elongata, Indotestudo forstenii, Manouria emys phaeryi, Mauremys (revised from Annamemys) annamensis, Mauremys japonica, Mauremys mutica, Ocadia sinensis, Pyxidea mouhotii, and Sacalia bealei have all reproduced in captivity in zoos or private collections. However, many of these are isolated instances. Based on the long term captive survival experiences with Cuora pani, C. serrata, Cyclemys dentata, C. tcheponensis, Malayemys subtrijuga, Manouria emys emys, Notochelys platynota, Platysternon ssp., and Sacalia quadriocellata, in both zoo and private hands, there is every reason why captive propagation of these species can succeed. With good fortune maybe even Geomyda depressa will reproduce. What is lacking are sufficient founder animals, effort and commitment. A black phase adult female reportedly from the central highlands of Hainan Island, China. Captive breeding should become the goal of anybody keeping more than a few of these turtles. Conservation and responsible herpetoculture can no longer afford to condone the typical collection consisting of a few specimens of numerous species or individual “trophy” specimens. Every effort should be made to maintain these species in sexually and genetically diverse groups ofa minimum of six or eight specimens. Only in this way can we learn all that is necessary and accomplish what is essential to help save the turtles and tortoises of Asia. Their plight in the Asian food markets is certain death whether in a medicine jar, or a cooking pot. In wild they face the bulldozer, the chainsaw and slash and burn forest fires like those witnessed in Indonesia in 1997. Some focus and effort on the part of herpetoculturists worldwide to breed the turtles and tortoises of Asia can well contribute to nothing less that their surviving extinction. This could well be the last best hope to ensure survivability of many of these species, especially when one considers the low reproductive rate and the long time required for many turtles to reach sexual maturity. Taken in context of the aforementioned onslaught these turtles face, captive reproduction seems essential. Larger questions of possible repatriation of captive bred progeny may not be answerable until such time as the moral, ethical and technological issues confronting the environment and the turtles themselves are solved. This may in effect become a multi generation exercise. Captive reproduction programs can therefore be rationalized as caretakers until such time in the future when these larger issues are resolved. At the very least, the turtles and tortoises of Asia will then have options they certainly would not have had otherwise as the current food market scenarios may well be taking many of these species into extinction. The options at that point become rather limited don’t they? If you are interested you can help. No doubt there are many well established, long term captive specimens of the species mentioned here that are in non breeding, genetically dead situations. Those specimens can and by all means should be consolidated into established groups. If you have such a situation or if you need any husbandry information not available in the care please contact Darrell Senneke at the Tortoise Trust USA. Bosco Chan contributed immensely for his timely updates on the Hong Kong markets. Thanks to Oscar Shiu, James Buskirk, Chris Hansen and Richard Fife for information and inspiration. Special mention to Dr. W. McCord for braving it out and visiting and documenting the markets in Guangzhou and Shenzhen. John Behler, Dave Collins and Rick Hudson for their efforts and recognition of this situation. 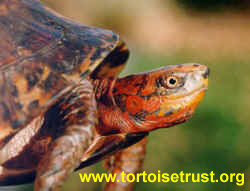 Sincere appreciation to the Tortoise Trust USA for providing this forum and Darrell Senneke for his valuable comments. Husain, L. and Sarker, S.U. 1995. Population, Eco-Biological Status, Captive Propagation and Conservation Problems of Lissemys punctata in Bangladesh. Proceedings, International Congress of Chelonian Conservation. SOPTOM, Gonfaron, France, pp.43 – 46. Jenkins, M.D. 1995. Tortoises and Freshwater Turtles: The Trade in Southeast Asia. TRAFFIC International, Cambridge, United Kingdom. van Dijk, P.P. 1997. Turtle Conservation in Myanmar: Past, Present and Future. Proceedings: Conservation, Restoration and Management of Tortoises and Turtles – An International Conference. New York Turtle and Tortoise Society, pp. 265 – 271. This species was misidentified as Cuora pani in Turtles of the World. 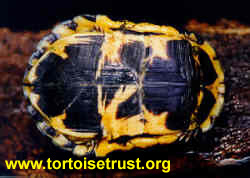 C. aurocapitata is distinguished by a lemon yellow head and streaked dark pigment associated with plastral seams as seen here. The female barely visible here is in a captive habitat designed specifically to replicate the rocky mountain streams which Platysternon inhabits throughout their natural range. 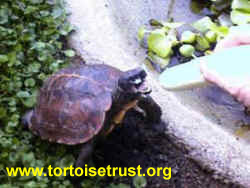 All information and photos used in these pages is copy written, Any use other than personal of the information or photos tendered here without the express written consent of the author and / or the Tortoise Trust USA will be subject to legal action.